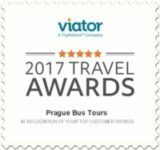 Prague Bus Tours is operated by Vega Tour. The key activity of Vega Tour is bus tour transportation. Vega Tour works with 150 modern tour buses and mini-buses and belongs among the TOP 5 coach operators in Europe. Vega Tour offers its clients bus transportation for sightseeing tours and excursion tours all over Europe, “ply transport”, transfers round the city, airport transfers, corporate transportation of persons, and a shuttle service. The Vega Tour brand received a prestigious Business Superbrands award in 2016 as well as in 2015. Vega Tour is also a member of ETOA, the European Tourism Association, and AČCKA and ACKČR, Czech tourism associations. Vega Tours operates among professionals in the convention industry in the Prague Convention Bureau and in the Economic Chamber of the Capital of Prague. The company is registered in the Commercial Register of the Municipal Court in Prague, Section C, Insert 35715th.